Los Angeles is the second-largest city in the US, and it’s never lacked coffee shops. 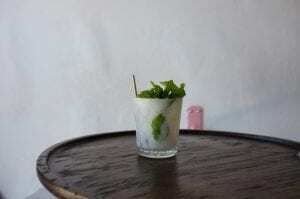 Whether they’re located on the idyllic stretch of beaches or in the streets of downtown, there has long been a plethora of cafés to choose from. But what has changed in recent years is the shift towards a focus on quality. Similar to the city’s culinary renaissance, LA has slowly evolved into one of the best cities in the world for specialty coffee. 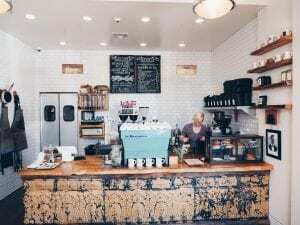 Take a look at the pick of LA’s specialty coffee shops. Los Angeles County is massive. The most populated county in the United States, it has 88 incorporated cities with more than 10 million inhabitants. So there are more than a few great coffee options. You can probably find a good café in most parts of LA, but these eight are, in my opinion, the stars among stars. These coffee shops are worth making a trip to (and trust me, the traffic is as bad as they tell you). These are the coffee shops that are leading the pack by serving coffee at the highest level. Each of these cafés has a unique voice and something special to offer. 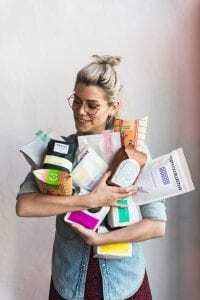 Voted Best New Cafe 2018 by Sprudge, Dayglow is more than your average coffee shop. 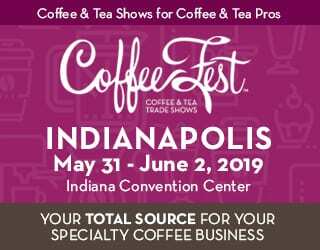 Known for its selection of beans from the best international and domestic roasters, it’s a destination for coffee geeks from around the world. The inviting space has accordion doors that let you spill onto the street. White, minimal decor is accented with touches of pastel pink and neon signs. The themed signature drinks are made using interesting techniques and they are what make Dayglow a notable destination. As the founder, I’m obviously biased, but I genuinely believe Dayglow is among the best coffee shops in LA. This minimalist space almost looks like an art gallery. Located in the Far East Plaza food mall in Chinatown, Endorffeine’s focused menu highlights delicate coffees and features a light-bodied espresso that is remarkably balanced. Founder Jack Benchakul’s methodical approach sets a standard that is unparalleled in Los Angeles. 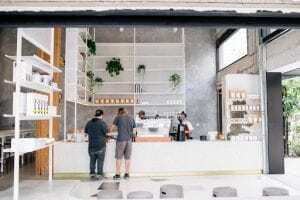 Anyone who has been paying attention to the specialty coffee scene in LA will know about Charles Babinski and Kyle Glanville. The owners of notable roaster Go Get Em Tiger and G&B Coffee have been very busy opening new locations seemingly every other month. The Los Feliz café is my personal favorite. The staff here is simply wonderful and they make a mean almond macadamia cappuccino. 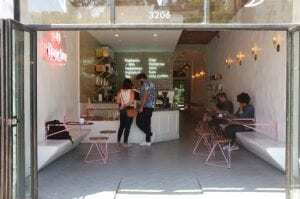 Over the past few years, a number of Australian cafés have opened in LA. My personal favorite is this gorgeous open space in the Art District’s Row DTLA development. 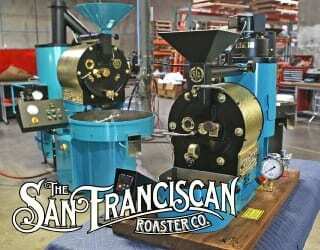 Paramount Coffee Project has seasonal offerings and some of the best coffees in the city. The menu changes monthly but always features impressive choices from guest roasters selected by the baristas. And the team does a remarkable job preparing them. 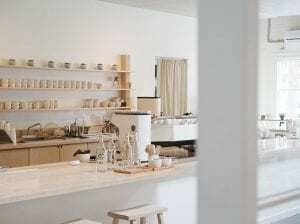 One of the most refreshing cafés in LA, Maru focuses on refinement. 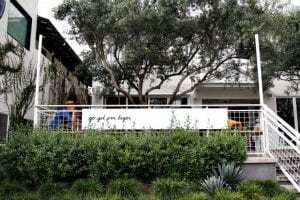 Owners Jacob Park and Joonmo Kim have filled a warehouse space in an unassuming part of the Arts District with a vision of tranquility. Natural light and soft tones create a pleasant spot to enjoy a thoughtfully presented coffee. This café is not technically in LA. Instead, it’s located in Santa Ana. 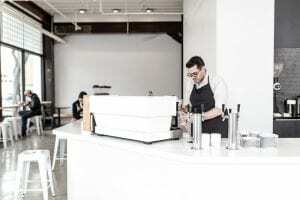 But it’s one of the most compelling cafés in southern California, so it’s worth the trip. Owner Truman Severson is an industry leader in beverage development. He innovates fun ways to adapt café classics into something remarkable. And then he serves them in this clean, minimalist space. It’s definitely a gem that’s worth making an effort to drive out to. Tourists visiting the Venice Beach boardwalk are treated with the best café on the west side. Run by famed barista Christopher ‘Nicely’ Alameda, Menotti’s has been setting a high standard for coffee since 2013. What sets this place apart is a dedicated staff of talented baristas who know how to make perfectly balanced espresso-based drinks. There’s a chalkboard menu for all to choose from, but there’s also a secret menu of specialty drinks for those who can find it. 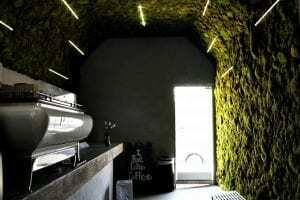 This mysterious cave of a café in an undeveloped block in downtown LA is my biggest design crush. 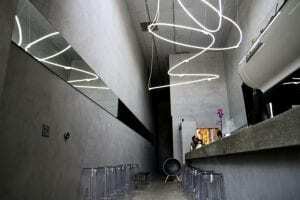 Owners Giorgia Cirillo and Christopher Grotjahn have almost created an art piece in this fascinating space. Beautiful modern ceramics are paired with an Italian-inspired coffee program. It’s a great place to meet new people, unplug, and enjoy the strange and compelling surroundings. Wherever your visit takes you in sunny Los Angeles, great coffee should be a part of your itinerary. 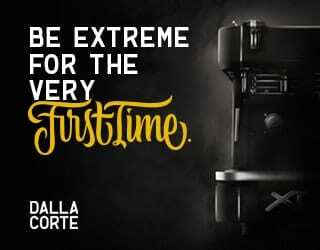 Use this list as a starting point to the fast-growing coffee scene here. You won’t be disappointed with a drink from any one of these options. Article written by Tohm Ifergan of Dayglow. 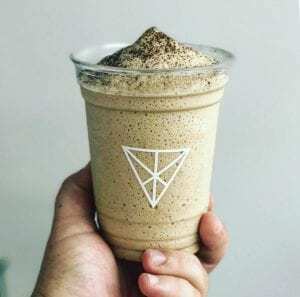 All views within this opinion piece belong to the guest writer, who is a local of Los Angeles, and do not reflect Perfect Daily Grind’s stance. How Does Coffee Affect Your Brain? 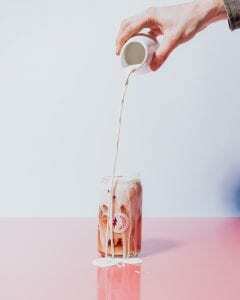 Are You Addicted to Caffeine?